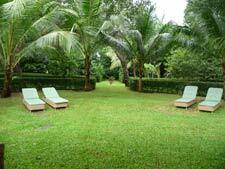 Villa AA BLF is an elegant 6-bedroom villa with over an acre of tropical gardens. It has direct access to Sandy Lane beach and privileges at both Sandy Lane and Royal Westmoreland for golf and tennis activities. Villa JAL MAN is an Oliver Messel designed villa that is deemed one of the most luxurious available on the island. Included is a professional staff who will pamper you with dinners in the gazebo overlooking the sea. Villa BS FUS is an amazing estate that keeps growing while maintaining its true character. It boasts 6 bedrooms on over 10 acres of gardens with sea views. The pool is tucked into the rock for a romantic grotto feel. Villa BS MUL was one of my most favorite villas that we visited. It is built around an old sugar mill and oozes character. Every room is graceful and overseen by an amazing butler. While this is a hillside villa, it includes a private beach house on Gibbs beach so you have the best of both worlds. After spending the first 3 nights in a free standing villa, we moved to a beachfront condo on Paynes Bay. It was great to see 2 different options like this. I loved the condo and could see either a family or 3 couples sharing a place like this. 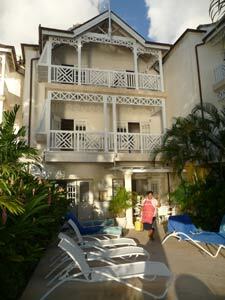 We were in the Mahogany Bay complex of 6 condos and ours was Villa BS STR. The value in this villa is unbelievable and it puts you on the beach with a private plunge pool and a staff of one who takes care of cooking, cleaning, and laundry. That was our Onita and she was just one big smile all day long. I loved the location of this villa because you could go for long walks on the beach and you could also walk to restaurants. Just across from our villa was a hip new bar/restaurant named Scarlett. Within view of our villa is the famous Cliff restaurant. Just 2 blocks down the road is Daphne's where we had a fabulous dinner! The atmosphere is very cool and the food was so delicious. I started with a fish carpaccio and then had the ravioli special. The best was kicking off our shoes after dinner and walking home on the beach with the crabs scurrying around in the moonlight. Let me quickly recap some of our other memorable meals out. First was lunch at The Tides, elegant, beachfront, and delicious…not to be missed. Our last night dinner was at Olives in the 2nd street area of Holetown. This area is very cool, it’s a square block lined with restaurants and bars with music and dancing flowing out into the street. We also took a drive to the South shore one night to visit a local’s favorite, Champers, it is beautifully set across the water and the service and food were perfect. During our travels we had a simple roti lunch in Speightstown…roti (a curried mixture of meat and or veggies in a roti wrap) is the way to go for a quick delicious lunch that doesn’t cost much. You'll find it on the menu at many cafes or go the more casual route by stopping at the Roti Den or Chefette to take it to go. I could go on and on about Barbados because there is so much going on there. This island is built on more than tourism so it has a real culture and beat of its own. This is great news for off-season travelers who want to travel during the value season but not miss out on all the hot restaurants and local activities. It's just easy to be in Barbados because you are surrounded by friendly people, the local language is English, and everywhere you go accepts US currency at a simple conversion of $1 for every 2 Barbadian dollars. I can’t wait to go back and my agenda for next time; 1) Polo match, 2) Picnic lunch from Roti Den for my hike, 3) Befriend a monkey, and 4) Dinner and dancing at St Lawrence Gap!